The above diagram shows a formerly-temperate glacier suddenly cooled by an abrupt change in climate (see Note 1 and Note 2). The glacier overlies bedrock possessing a joint system comprising interconnected vertical and horizontal joints. It is assumed that groundwater can percolate through the joints and that the temperate ice incorporates a significant fraction of mobile water. The central portion of the ice sheet exerts hydrostatic pressure creating a pressurized aquifer when glacial water seeps downward into the bedrock. The water is trapped beneath the glacier, its cold-based edges and a layer of frozen bedrock. Given the circumstances shown in the above diagram, a pressurized aquifer is a certain result. 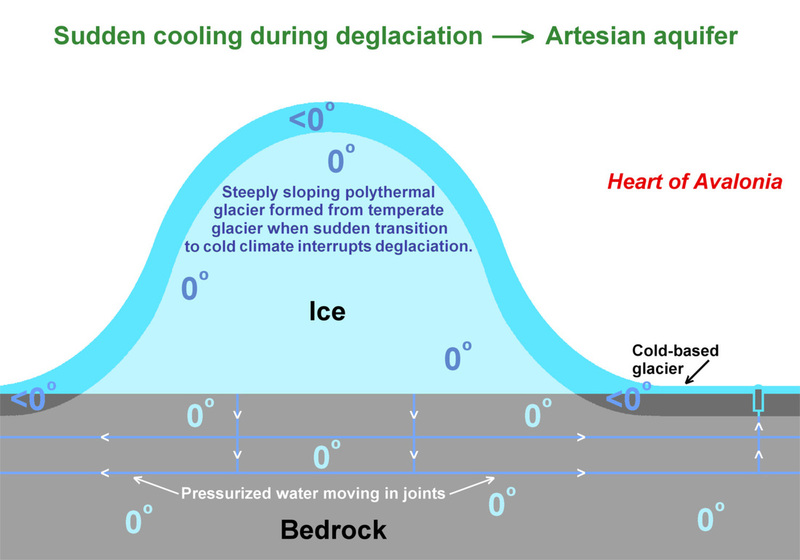 In places where ambient hydrostatic pressure is lower than that under the thickest and highest part of the ice sheet, there is potential for artesian groundwater to break through toward the surface, freezing near the surface, and thereby disrupting bedrock. The complete set of circumstances described above could have existed at certain locations on the Avalon Peninsula during intervals of the pre-Holocene deglaciation time period (Note 1). Pressurized groundwater could help explain observations of bedrock frost heave (specifically, hydraulic bedrock frost heave, Note 5) that apparently occurred underneath glacial ice (see Illustrative Features).